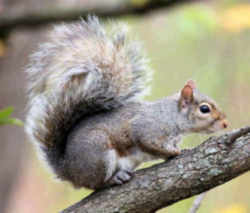 The gray squirrel, (Sciurus carolinensis,) was adopted as the Kentucky game animal in 1968. As the name suggests, the eastern gray squirrel has predominantly gray fur, but it can have a brownish color. 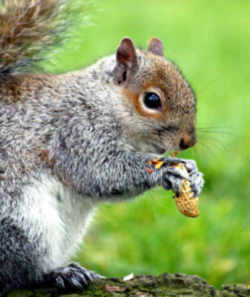 Like many members of the family Sciuridae, the eastern gray squirrel is a scatter-hoarder; it hoards food in numerous small caches for later recovery. The genus name Sciurus is from the Greek words skia (shadow) and oura (tail), a reference to the bushy tail which casts a shadow on the squirrel. The Latinized species name carolinensis (of Carolina) refers to the region from which the first scientific specimen was collected. The eastern gray squirrel or grey squirrel (depending on region), Sciurus carolinensis, is a tree squirrel in the genus Sciurus. It is a common inhabitant of most areas of North Carolina from "the swamps of eastern North Carolina to the upland hardwood forests of the piedmont and western counties." He feels more at home in an "untouched wilderness" environment, although many squirrels inhabit our city parks and suburbs. During the fall and winter months the gray squirrel survives on a diet of hardwoods, with acorns providing carbohydrates and proteins. In the spring and summer, their diet consists of "new growth and fruits" supplemented by early corn, peanuts, and insects. The Gray Squirrel prefers hardwood forests of the Piedmont Region, mountains, and river and stream floodplains where an abundant supply of nuts, acorns, fruits, and flowers can be found. It will also eat insects and occasionally bird eggs. The Gray Squirrel constructs two types of nests. One is in a tree cavity, and is used for rearing young and for winter shelter. The other type of nest, which looks like a ball of dry leaves and twigs lined with plant fibers, is lodged in the upper branches of a tree. 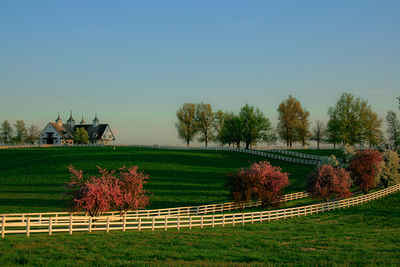 It is used as temporary shelter in both summer and winter. Main predators of the Gray Squirrel include hawks, owls, the Coyote, foxes, the Bobcat, and occasionally weasels, raccoons, and snakes. 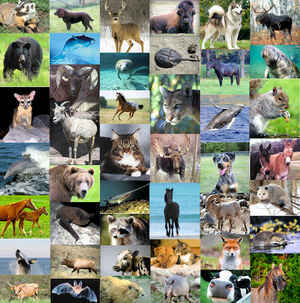 Wild individuals have an average life expectancy of 5 years. The law designating the gray squirrel as the official Kentucky state state wild animal game species is found in the Kentucky Revised Statutes, Title 1, Chapter 2, Section 2.085. 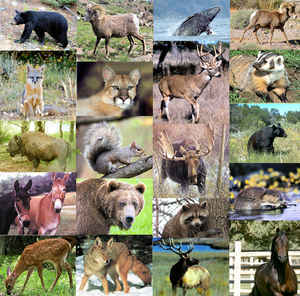 2.085 State wild animal game species. The gray squirrel is named and designated as the state wild animal game species. 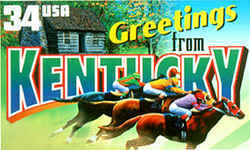 History: Created 1968 Ky. Acts ch. 219, sec. 1, effective June 13, 1968.